17SEP14 - "On Point" Radio - Does Chess Still Matter? Not playing the final round were: Paul Godin, Arthur Barlas, Ray Paulson, Bruce Felton, Alan Condon, Jim Hankard, Gail Lingner, Stan Talcott and Rick Evans. with five tournaments completed and three to go. The top 10 players qualify based on winning percentage. A minimum of 20 games need to be played this season in order to qualify. This Season Wins Losses Draws Pct. REMINDER: The next tournament at the club, the Reggie Boone Memorial, will start January 7, 2015. Players must be present by 7:10 p.m. in order to be paired for round 1. It is with great sadness that we report that longtime club member Martin Laine of Lunenburg has passed away at age 64. 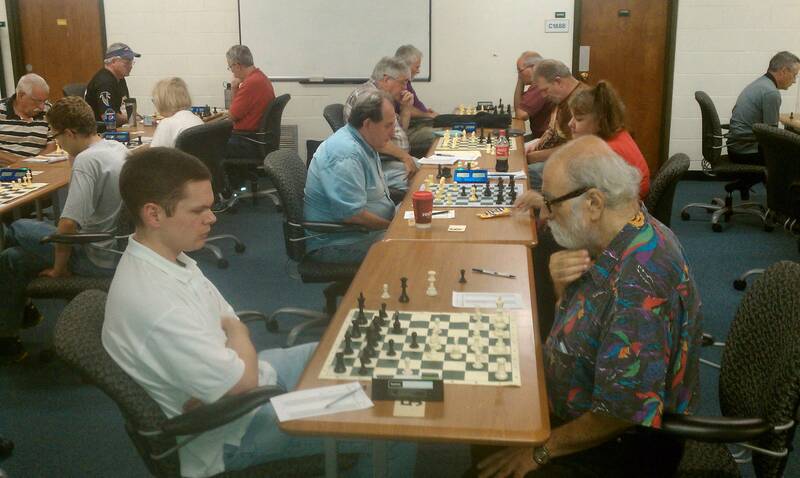 Marty was club champion in 2008 and the longtime co-host of the monthly Chess Chat programs on Fitchburg Access Television. An obituary will be posted on the club website as soon as it becomes available. The 2015 club championship will be named in his honor. A Martin Laine Memorial tournament will be established to run annually. May he rest in peace. Receiving half-point byes were Alan Condon, Gary Brassard, Paul Lynch, George Miller, Rick Evans and Brian Biglow. Not playing the round were Jackson Parker, Vince Premus and Kirk Beeler. Francis Scanlon withdrew from the tournament. No byes in last round of tournament. REMINDER: Players must be present by 7:10 p.m. on December 17 in order to be paired for Round 5. LePoer and Miller are receiving half-point byes.. REMINDER: Players must be present by 7:10 p.m. on December 10th in order to be paired for Round 4. Receiving half-point byes were Geoff LePoer, Lenny Arsenault, Tom Fratturelli, Dave Couture, Jackson Parker, Stan Talcott, Vince Premus, Francis Scanlon, Rick Evans and Kirk Beeler. Martin Laine was withdrawn from the tournament. REMINDER: Happy Thanksgiving to all! There is no chess on Wednesday, November 26. Players must be present by 7:10 p.m. on December 3 in order to be paired for Round 3. Brett's recent undefeated performance in the club's Ernest Fandreyer Memorial raised his rating to 2201. Congratulations Brett! Receiving half-point byes were Bruce Felton, Paul Godin, Martin Laine, Joe Bennett, Alan Condon, Paul Lynch, Tom Fratturelli, Dave Couture, Jackson Parker, Vince Premus, Richard Bennett, Francis Scanlon and Kirk Beeler. REMINDER: Players must be present by 7:10 p.m. on November 19th in order to be paired for Round 2. Thanks to Paul Godin and Arthur Barlas for collecting, translating, and entering all of these games. Brett Kildahl won the 2014 Ernest Fandreyer Memorial with a perfect 5-0 to win his second tournament in a row. 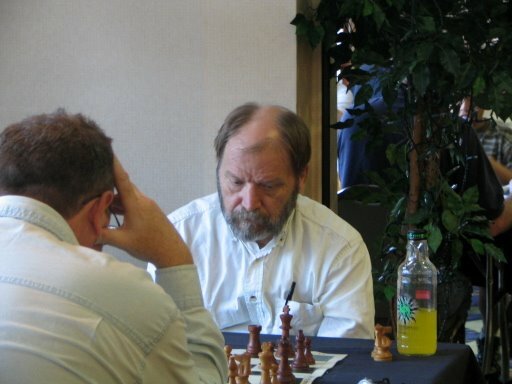 Bob Mathieu of Ashburnham, who came into the tournament rated 1461, took clear 2nd place gaining 185 points in the process to raise his rating to an all-time high of 1646. Not playing the final round were Arthur Barlas, Paul Lynch, Paul Godin, Alan Condon, Stan Talcott, George Mirijanian, Martin Laine, Bruce Felton, Joe Bennett, Rick Evans, Jackson Parker, Vince Premus, Don Briggs, Richard Bennett, Kandy Lynch, Kirk Beeler and Duncan Premus. REMINDER: The next tournament at the club, the George Sturgis Memorial, starts Wednesday, November 12th. Players must be present by 7:10 p.m. in order to be paired for Round 1. The following table shows the standings to qualify for this year's club championship with 4 tournaments completed and 4 to go. The top 10 players qualify. Club Members Current Rating As Of 11/5/14 Total Games This Season Wins Losses Draws Pct. Receiving half-point byes were Dave Thomas, Arthur Barlas, Ken Gurge, Lenny Arsenault, George Mirijanian, Geoff LePoer, Martin Laine, Gail Lingner, Francis Scanlon, Jackson Parker, Vince Premus, Don Briggs, Richard Evans, Duncan Premus, Kandy Lynch and Kirk Beeler. Joe Bennett withdrew from the tournament. Receiving half-point byes were Roger Cappallo, Joe Bennett, Arthur Barlas, Ken Gurge, George Mirijanian, Bruce Felton, Alan Condon, Jackson Parker, Don Briggs, Randy McLaughlin and Duncan Premus. Receiving half-point byes were George Mirijanian, Bruce Felton, Alan Condon and Dave Couture. Not playing the final round were George Mirijanian, Bruce Felton, Mike Lally, Gary Brassard, Dave Couture, Bob Mathieu, Kandy Lynch, Kirk Beeler and Stan Talcott. REMINDER: The next tournament at the club, the Ernest E. Fandreyer Memorial, begins Wednesday, October 8. Players must be present by 7:10 p.m. in order to be paired for the round. The following table shows the standings to qualify for this year's club championship with 3 tournaments completed and 5 to go. The top 10 players qualify. Club Members Current Rating As Of 10/1/14 Total Games This Season Wins Losses Draws Pct. Receiving a half-point bye were Mike Lally and Gail Lingner. Not playing the round were Vince Premus, Kandy Lynch and Duncan Premus. Larry Gladding was withdrawn from the tournament. "On Point" Radio - Does Chess Still Matter? Receiving half-point byes were Bruce Felton, Dave Couture, Richard Bennett, Kandy Lynch, Randy McLaughlin and Francis Scanlon. Not playing the round were Larry Gladding and Martin Laine. Receiving half-point byes were Ray Paulson, Larry Gladding, Martin Laine, Lenny Arsenault, Stan Talcott and Kandy Lynch. Receiving half-point byes were Ray Paulson, Bruce Felton, Larry Gladding, Gary Brassard, Martin Laine, Alan Condon, Tom Fratturelli and Francis Scanlon. Not playing the final round were Marty Laine, Mike Manisy, Joe Bennett, Paul Lynch, Jackson Parker, Alan Condon, Stan Talcott, Don Brigss, and John Bastarache. Reminder: The next club tournament, the Hervey R. Brisson Memorial, starts September 3rd. Players must be present by 7:10 PM in order to be paired for the round. The following table shows the standings to qualify for this year's club championship with 2 tournaments completed and 6 to go. The top 8 players qualify. Club Members Current Rating As Of 8/27/14 Total Games This Season Wins Losses Draws Pct. The 74th New England Open will be held Labor Day weekend, August 30-September 1, at the DoubleTree by Hilton Hotel in Leominster. 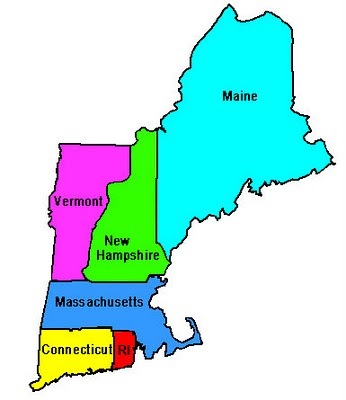 Players wishing to participate and enter in advance should visit www.masschess.org for complete details or else see August issue of "Chess Life" for Tournament Life announcement. Receiving half-point byes were Ray Paulson, Mike Manisy, Dave Couture and Brian Biglow. Alan Condon had previously withdrawn from the tournament. Receiving half-point byes were George Mirijanian, Gail Lingner, Randy McLaughlin and Francis Scanlon. Withdrawn from the tournament were Alan Condon, Tom Fratturelli and Larry O'Rourke. Receiving half-point byes were Mike Manisy, Ken Gurge, Paul Lynch, Dave Couture, Tom Fratturelli, Larry O'Rourke, John Bastarache and Kandy Lynch. Receiving half-point byes were George Mirijanian, Alan Condon, Lenny Arsenault, Paul Lynch, Tom Fratturelli, George Miller, Larry O'Rourke, Stan Talcott, Richard Bennett, John Bastarache, Kandy Lynch and Francis Scanlon. Paul Godin of Bedford and Steve Nelson of Fitchburg were co-winners of the 2014 Harlow B. Daly Memorial. Ray Paulson of Lowell, Roger Cappallo of Groton, and George Mirijanian of Fitchburg tied for 3rd. Dave Couture of Westminster was top U1700 and Richard Bennett of Gardner was top U1400. Our best wishes for a speedy recovery from his hospitalization and heart double-bypass surgery go out to longtime club member Wayne Steadman, who unfortunately had to withdraw from the tournament. Many thanks to those who signed Wayne's "Get Well" card at the club. Our sincerest thanks go out former Wachusett CC members (clockwise from left) Tom Weideman (St. Bernard's), Lee Denis (Leominster High), Chris Coleman (Fitchburg High), Bob Anderson (St. Bernard's), Bryant Hopkins (Leominster High) and Frank Everett (Oakmont Regional) on their surprise visit to the club on Wednesday night. We were overjoyed by their visit and wish them to come again. The following is from Tom Weideman (who it should be noted is a former Hawaii State Chess Champion). This is a short chess memoir I wrote several years ago. It includes 14 games that I consider my most memorable. While you might find some of them interesting (they all come with the back stories that I think make them interesting), the games that fall squarely into the category of WCC remembrance are #4, #7, and #8. Hope you like them. Feel free to post or link to anything you find on that blog. Receiving half-point byes were Mike Lally, Arthur Barlas, Martin Laine and George Mirijanian. Not playing the round were Vince Premus and Francis Scanlon. Withdrawing from the tournament were Carissa Yip, Wayne Steadman, Don Briggs, Stan Talcott and Larry Sleet. Receiving half-point byes were Carissa Yip, George Mirijanian, Mike Manisy, Arthur Barlas, Martin Laine, Tom Fratturelli, Don Briggs, Vince Premus, Wayne Steadman, Stan Talcott, Larry Sleet and Francis Scanlon. Receiving half-point byes were Carissa Yip (2174), George Mirijanian (1963), Larry Gladding (1812), Joe Bennett (1796), Ken Gurge (1768), Lenny Arsenault (1730), Tom Fratturelli (1682), Vince Premus (1377), Stan Talcott (1318), and Francis Scanlon (1001). 10-year-old Carissa Yip of Chelmsford clinched the club championship this week with one week still to go. She is currently undefeated for the entire season including the championship tournament. This is just another feather in Carissa's cap on her way to becoming the youngest ever female master in U. S. history. Congratulations Carissa! Receiving a full-point bye was Richard Bennett. Receiving half-point byes Jackson Parker, Don Briggs and Larry Sleet. Not playing the round were Ray Paulson and Francis Scanlon. Vince Premus withdrew from the tournament. Receiving half-point byes were Ray Paulson, Arthur Barlas, Mike Manisy, Jackson Parker, Don Briggs, Stan Talcott and Larry Sleet. Not playing the round were Gail Lingner and Vince Premus. Player W L D Pct. Receiving half-point byes were Martin Laine, Lenny Arsenault and Larry Sleet. Not playing the round were Gail Lingner and Vince Premus. Withdrawn from the tournament were Brandon Wu, Paul Connelly, Bob Mathieu and Vinny Spingola. Larry O'Rourke 1-0 Larry Sleet. Receiving half-point byes were Ray Paulson, Brandon Wu, Paul Connelly, Alan Condon, Gail Lingner, Bob Mathieu, Don Briggs, Vince Premus, Francis Scanlon and Vinny Spingola. With Carissa's participation today in the BCF Spring Championship at the Boylston Chess Club in Somerville - where she tied for second place - she raised her rating from 2143 to 2157 and is now just 43 points away from becoming a national master. 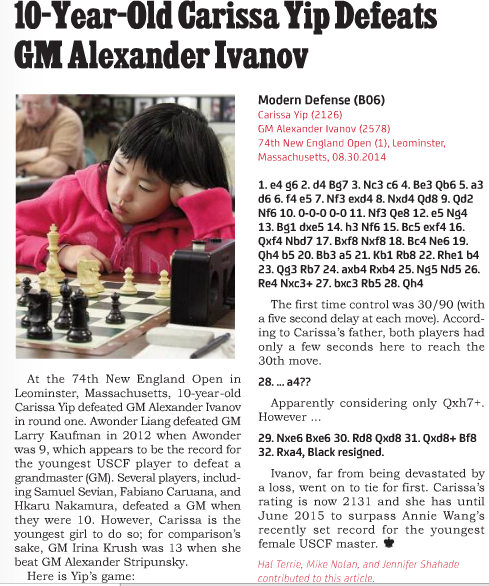 One of the players she defeated was national master and Boylston Chess Club champion Lawyer Times (rated 2282). N.Y. Times article on Carissa and Annie Wang. (*) Have not played 1st round yet. Receiving a full-point bye was Francis Scanlon. Receiving half-point byes were Ray Paulson, Mike Manisy, Brandon Wu, Paul Connelly, Gail Lingner, Bob Mathieu, John Bastarache, Vince Premus, Stan Talcott and Vinny Spingola. REMINDER: Players in the "B" Division must be present by 7:10 p.m. in order to be paired for the round Players who were given byes in Round 1 will be paired if they show up for Round 2. 1) Carissa Yip - At 10 years old, Carissa is by far the youngest participant. Her accomplishments are already too numerous to mention here, but it must be noted that she is the youngest ever female expert in recorded USCF history, achieving that record at the age of 9. She is also poised to become the youngest ever female master. Her current rating is 2137, having increased in each of her last 7 tournaments. A rating of 2200 is needed to achieve the title of master. GM Irina Krush currently holds the record for youngest ever female USCF master. Irina was 12 years old when she did it. Carissa's record at the club this year was 19 wins, 1 draw, and 0 losses. 2) George Mirijanian - George is the current club champion. He is another player with accomplishments too numerous to mention. He has been club champion 16 times, winning his first in 1977. He held the title of club champion from that first one in 1977 until 1984 - the longest streak in club history. 3) Bruce Felton - 2-time club champion in 2004 and 2005. 4) Steve Nelson - Steve was the club champion in 1976. After decades away from the board, he returned this season and has shown that he is still tough competitor. 5) Paul Godin - Paul was club champion back in 1967 and has had a successful season, tying for 2nd in the Harlow B. Daly Memorial, tying for 3rd in the GM Lubomir Kavalek Open, and tying for 3rd in the Jonathan Yedidia Open. 6) Mike Lally - Mike comes to us all the way from Leverett, out in "The 4-1-3". This is Mike's first full year at the club and he's shown his mettle by winning the George Sturgis Memorial by a full point. 7) Gary Brassard - Gary has been runner-up in a previous club championship and is certainly hoping to do one better than that this year. He tied for 3rd place in both the George Sturgis Memorial and the Reggie Boone Memorial this season. 8) Larry Gladding - Larry has been club champion 3 times, winning his first in 1992 and his most recent in 2009. Carissa Yip of Chelmsford won all 5 games to take 1st place in the Evert Siiskonen Memorial tournament. In doing so she raised her rating to yet another new all-time high of 2137! Carissa is the top rated 10 year old girl in the country (and the 2nd highest girl under age 13). Tying for 2nd place were recently returned players Mike Manisy of Templeton and Joe Bennett of Hubbardston. 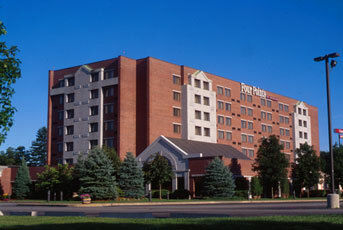 Carissa Yip, 10, of Chelmsford reached a new all-time high rating of 2118 by tying for 3rd in the Massachusetts Game/60 Championship on Sunday, April 27, at the Best Western Royal Plaza Hotel in Marlborough. Carissa drew with life senior master Denys Shmelov (round 1), drew with candidate master David Carter (round 2), beat high-rated Class A player Aidan Sowa (round 3), and then defeated high-rated expert Brian Salomon (round 4) to finish with a score of 3-1. Carissa will be the highest-rated participant in the Wachusett Chess Club Championship. The 8-player round-robin championship begins May 7, the same day that the U.S. Championship starts in Saint Louis. Receiving half-point byes were Ray Paulson, Dave Couture, Martin Laine, and Vince Premus. Not playing the round were Geoff LePoer, Dave Thomas, Lenny Arsenault, Alan Condon, George Miller, Francis Scanlon, and Vinny Spingola. Receiving half-point byes were Arthur Barlas, Dave Thomas, Lenny Arsenault, George Miller, Don Briggs, Larry O'Rourke, John Bastarache, Francis Scanlon and Vinny Spingola. Not playing the round were Geoff LePoer, Alan Condon, Gail Lingner and Stan Talcott. Francis Scanlon received a full-point bye. Receiving half-point byes were Mike Lally, Arthur Barlas, Geoff LePoer, Alan Condon, Gail Lingner, George Mirijanian, Dave Thomas, George Miller, and Vinny Spingola. Stan Talcott did not play the round. The following table shows the standings to qualify for this year's club championship with 3 games to go. The top 8 players qualify. Club Members Current Rating As Of 4/9/14 Total Games This Season Wins Losses Draws Pct. Receiving half-point byes were Geoff LePoer, Dave Couture, Lenny Arsenault, Alan Condon, Gail Lingner, Jackson Parker, Stan Talcott, John Bastarache, and Vince Premus. The following table shows the standings to qualify for this year's club championship with 4 games to go. The top 8 players qualify. Club Members Current Rating As Of 4/02/14 Total Games This Season Wins Losses Draws Pct.